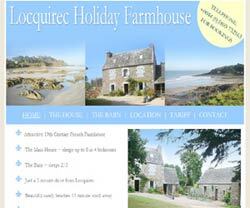 Holiday Cottage advertising in Cornwall and Devon with Cornwall Online. Through our policy of listening to our clients individual needs and keeping abreast of new technologies, we will be able to provide you with a variety of cost effective solutions. By promoting your business on the Internet you have the potential to reach a truly massive world-wide audience at a fraction of the cost of conventional advertising. Interactive pages can be provided to facilitate easy communication between potential clients and yourself, together with the ability to provide constantly updatable information such as special offers / late vacancies. In fact the individual needs of any type of business can be catered for at a surprisingly low cost. 1. NO COMMISSION TO PAY - Unlike many of our competitors, do not request any commission from your bookings or any additional charges to your clients. We are solely here to cater for your needs and take pride in the positive feedback. 2. NO HIDDEN CHARGES - You may update your page at anytime of subscription, at no extra cost. We aim to implement changes within 24 hours of receiving the requests. 3. LIMITED NUMBER OF ADVERTISERS - We actively limit the number of advertisers on Cornwall Online. This means that we have a limited number of slots available, thereby increasing the number of enquiries / referrals to each customer. 4. INCREASE YOUR TRAFFIC - We optimise each page for the search engines and actively monitor and amend our pages to maintain our rankings. This package is suitable for anyone, whether you are just starting a new venture or are a well established business and looking to widen your advertising. Please contact the office regarding our additional extras that can be integrated into your page. or contact us via telephone on 01579 557343. 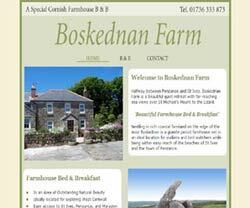 NEED YOUR OWN ONLINE WEB PRESENCE - WE CAN CREATE AND HOST YOUR STANDALONE, BESPOKE WEBSITE? ITS Web Design offers a complete website design and development service no matter what size of website you require. Whether you are starting from scratch or your existing site needs a revamp we will provide a cost effective search engine friendly solution. We pride ourselves on being able to deliver high quality, cost effective web designs and giving 100% customer satisfaction. In following years the price will drop to reflect our Easy Web Hosting Package below, plus just £25 for the domain name management if required. If you have your own website and find the editing HTML and FTP of your pages difficult and time consuming, transfer the storage to our system and we will update the site free of charge. If you require us to manage your domain name, there is an additional charge of £25 per year but we do provide FREE e-mail accounts with up to 5 mailboxes as part of the package.